At a distance, all roof ice melt systems may look alike. Just how does Radiant Edge PRO ice melt system compare? More energy efficient: Radiant Edge PRO ice melt system uses 33% LESS energy than Company A.
Radiant Edge PRO circuits extend 50% FURTHER, so fewer home run circuits. Less heat is lost downward to roof deck: Radiant Edge PRO ice melt system has 72% LESS roof contact. 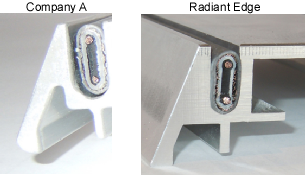 Thin extrusion subject to warping: Radiant Edge PRO ice melt system is twice as strong. Higher percentage of heat to ice and snow: Radiant Edge PRO ice melt system has 45% MORE top surface area. Why is Radiant Edge better? Minimize heat lost downward to the roof deck due to surface contact. Eliminate air gaps in the heat transfer path. Air is an insulator and the enemy of efficient heat transfer. Problem: Drip edge. Inefficient Heat Transfer to Drip Edge. SUMMIT’S SOLUTION: Radiant Edge’s heater cable nests in a snug slot, and its massive profile promotes direct heat transfer to the drip edge to melt ice and snow. (Rules # 2, #3, and #4). Problem: Electrolysis Risk With Dissimilar Metals: Contact between the aluminum base and a copper cover will eventually corrode due to electrolysis. SUMMIT’S SOLUTION: Summit has a proprietary isolator coating that prevents contact between the dissimilar metals. Problem: Three Heaters Required: Company A’s panel requires 50% more heat and energy to perform. Excessive heat loss downward and low cross section makes their’s need more heat to melt the ice and snow. SUMMIT’S SOLUTION: Every feature of Radiant Edge is designed to minimize heat loss and maximize heat transfer to the melting surfaces. Radiant Edge uses just two heaters to get the job done so it costs much less to install and operate. 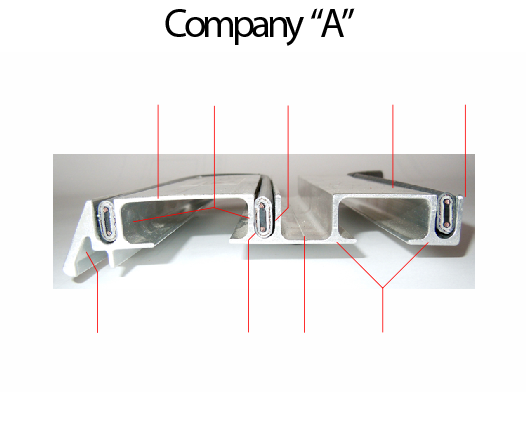 Radiant Edge conveniently has an auxilliary slot for a return raceway if needed.